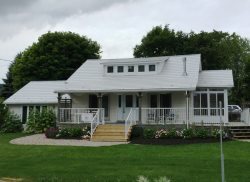 Shorehill is a collection of three distinct cottages, directly on the waters edge of Picton Bay in beautiful Prince Edward County, great location for wedding party stays. Although this property is in close proximity to all you want to see and do, the location is private and quiet as it is far from busy traffic, down a long private lane. The view across the water is directly West so the sunset is a spectacle photographed by every guest. The cottages have been extensively redesigned this year with all new furnishings, bedding, linens, towels, art, kitchen and BBQ equipment. The design goal was to create spaces that will meet all of your vacation needs and exceed your expectations regarding cottage life. For those who like fishing or just paddling about, bring your boat or canoe or Kayaks. There are boat launches near by for the larger boats and Shorehill has a new dock to tie them up to. There are new smart TVs with Satellite, Apple TV, HDMI cables and free WiFi, books and puzzles. There is ample parking and beach passes for access to all the world renowned Sandbanks and Prince Edward County beaches and parks. 4 passes total included with your rental. Named after Jules Verne - the literary giant who gave us the wonderful sea story Twenty Thousand Leagues Under the Sea. A two level cottage, renovated with all new furnishings, the Verne is perfect for two couples as it allows for plenty of space to be together and space to be apart. Your attention will be fully engaged by the view west over the water and passing sailboats from the large cathedral ceiling living room and breezy glass/screened solarium. The name need not be explained but we know he may have been happy writing The Old Man and the Sea in this little gem of a cottage. Fully renovated this year the Hemingway has a bit of an industrial edge. It is an open concept cottage like a hotel suite. The cottage feels large but still cosy.Walk out onto a private deck with space to eat or lounge. The view of passing sail boats across the water with and incredible sun sets will keep you entertained for hours. When one thinks of Joseph Conrad, Heart of Darkness is the first book to come to mind but there is nothing dark about this cottage. Joseph Conrad wrote several books about the sea which you will find inside the cottage. The Conrad is a two story cottage great for five couples or a couple families as it has 2 fully equipped kitchens big enough to be comfortable for all the people that always want to help in the kitchen and 2 living rooms plus a solarium! Check in is 10, check out is 3 on Saturdays. Each house has keypad access. You will be provided with access info after full payment has been made. This is a residential area so respect for neighbours is important for you to enjoy your stay. This is a lakeside property so all children must be accompanied by an adult while they are outside and it would be advisable that children wear flotation accessories in case of misadventure. Dogs are allowed but must be on a leash while outside. Shorehill exceeded our expectations! We enjoyed a family gathering of several generations. Would be happy to return! Very clean and well appointed cottages in a stellar location on Picton Bay. One of the highlights was dining on the deck watching the sailboat racing as the sun set. We will be back! I had a tour today of the recently opened very stylish Shorehill Cottages that were designed by the owner John Roberts. The location on the water is amazing and all of the cottages have outdoor porches and there is a large deck and a dock on the water! The furnishings are very modern with many classic design pieces. The cottages are well equipped including dishes, towels etc. and everything is new. We having been looking for cottages in PEC for a future high school reunion so we are definitely booking this! We loved it all. Will definitely book it again! The kitchen had everything you need to cook a meal. The bathroom had a wide variety of different shampoos/conditioners to choose from. I was impressed with how comfortable the beds were! The best part was certainly the view over looking the water. Great experience, thanks John! Shorehill cottages was a wonderful escape with the surroundings of art and comfort. We had a wonderful time relaxing by the water off the deck and exploring all the County has to offer. The host is gracious and attentive to anything you need. We shall go back! Thank you. This is a residential area so respect for neighbours is important for you to enjoy your stay. Fireworks are strictly prohibited. This is a lakeside property so all children must be accompanied by an adult while they are outside and it would be advisable that children wear flotation accessories in case of misadventure. Due to the water level changes of lake Ontario this year, swimming from the dock is up to each individual's discretion. Boats can be launched at Picton Harbour. You can tie up to the dock. 12 or 15 foot boot. Please confirm with owner prior to bringing your boat. Each house has keypad access. You will be provided with access info after full payment has been made. Pre-authorized Damage deposit is required; however, not charged upfront. Our cancellation policy can be found here. Visa and Mastercard accepted.